While most people seem to visit for a day on a cruise ship, there are many things to do in Santorini to fill up a week or two of your time! We fell in love with Santorini. A lot of people tell us "they don't like Santorini, it's too busy." But we found it to be a magical destination. Disclaimer: There are affiliates in the post. If you choose to visit any of the recommended tours we earn an income at no extra cost to you. I can understand why cruisers dislike Santorini. They arrive in the middle of summer at the height of the cruise season with tens of thousands of other people. 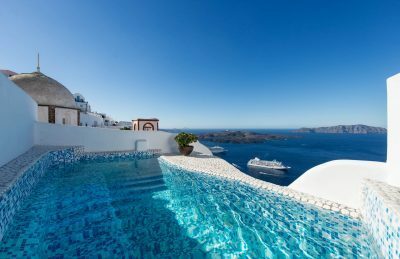 So our advice is, don't visit Santorini on a cruise, instead, book a luxury cave hotel with a beautiful infinity pool, and spend a week exploring the island. If you do this, you too will fall in love with Santorini too. I don't think we've ever seen such a beautiful vacation destination and if you don't agree, take a look at the photos below and it may change your mind. Simply walking around the village of Oia or Fira is a wonderful experience, but getting out on a tour to really explore the island is a must. We also rented a car in Santorini and this gave us a lot of freedom to do Santorini Sightseeing on our own. We rented directly once we got to the island. We took a few tours in Santorini and these were our favorites. Get Your Guide is a tour company we have used in several companies around the world and what we used in Santorini. You can book tours in advance and most have easy cancellation with 24 hours notice. Santorini Photography Tour - Dave is a photographer so we didn't take this, but we recommend taking a tour to make the most of the experience. This tour comes highly recommended and is likely to sell out. Santorini has some iconic photography destinations and being on a tour will get you to them at optimal times. Believe me, we got lost a lot looking for our iconic photographs. You can customize your tour to choose the places you want to capture the best photographs of. Part of the attraction of Santorini is the luxury and elegance of the hotels. When you get out of the taxi and walk up to the caldera for the first time, the view literally takes your breath away. I honestly gasped at its beauty. If there is one time to splurge in your life on a hotel, this is the time to do it. 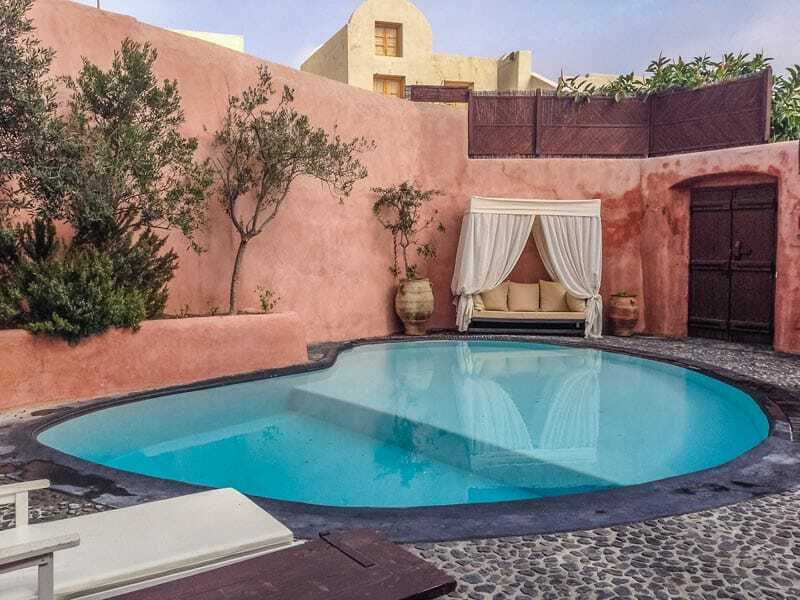 We stayed in three different luxury hotels in Santorini and each one made the trip even more special. You will be able to bask in the sun by the infinity pool and have the most spectacular meal in peace and quiet. No matter how busy the streets of Santorini get or how packed they are with cruisers and tourists, you'll have a quiet sanctuary in your cave hotel. You cannot truly appreciate the beauty of Santorini until you witness it from the sea. 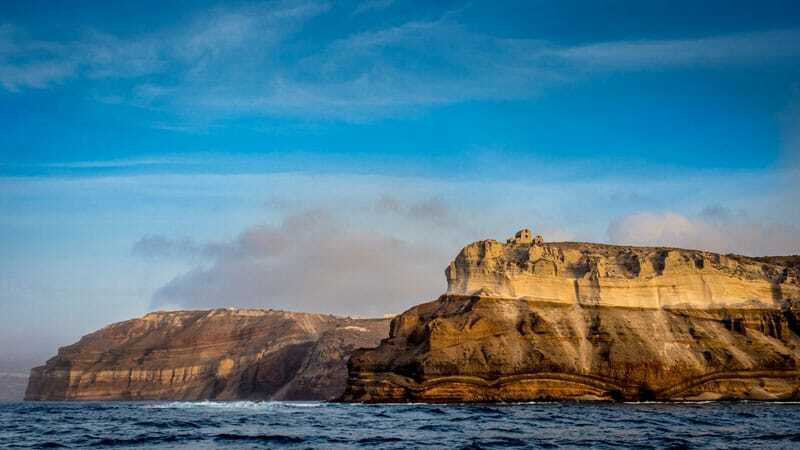 The massive sea cliffs are mesmerizing. Plus on a sailing trip, you can go snorkelling, visit some of the lesser visited beaches, and have a swim in the hot springs. There are several boat tours around Santorini and Get Your Guide has several you can book in advance. We suggest a sunset cruise for some of the best caldera views. Black Beach is the most popular sunbathing spot on the island with many restaurants and markets lined along the sand. It is worth spending a couple of days here rather than simply taking a day trip. We actually stayed in the area so that we could get some optimal beach time in. This is a popular stop for day cruises and sailing cruises, but it is nice to visit early in the day when the crowds are low. Using our car rental, we drove to the parking lot, packed a picnic and spent the morning on Red Beach taking in the gorgeous views. Staying in Oia was our favorite location on Santorini. There are so many things to do here and it is home to some of the most iconic views on the island. There are many places you can duck into a side street to explore hidden alleyways of cobblestone. There are famous views of Oia but when exploring the hidden pathways you will find different views of the Caldera. 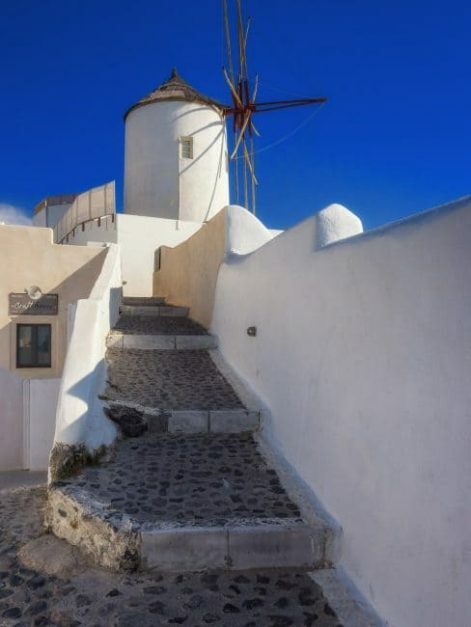 Oia is where you'll find the windmills, the famous blue domes and has some excellent shopping. Be sure to walk down the path to the beach of Oia. 300 steps down is a completely different atmosphere to Ammoudi Bay. The small village has several tavernas and there is a popular beach. If you want a little adrenaline in Oia, you can do some cliff jumping too! There are numerous restaurants in Oia serving delicious Greek cuisine. Some of the best restaurants are inland along one of the many cobblestone streets, but nothing ssays romance like toast over one of the most magnificent views in the world. Suggested restaurants: See Trip Advisor Reviews for Oia Restaurants. 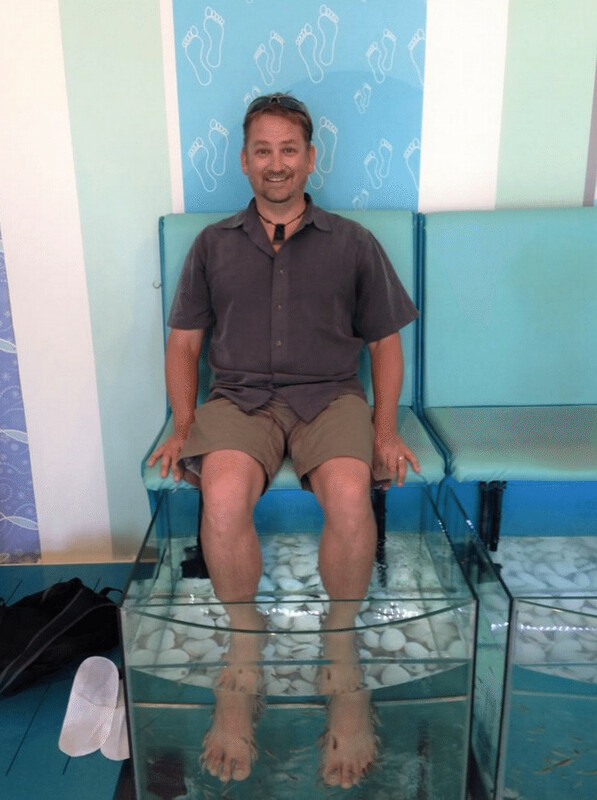 It may not be one of the typical things to do in Santorini, but after all that walking, a fish spa is just what your feet require. We always wanted to do a fish spa, but wondered just how clean they'd be in places like Thailand or Cambodia. So when wandering the streets of Oia we saw a fish spa and said "let's do it!" It is one of the most unique spas you'll ever have. While crowds of people gather at the caldera to watch the sunset, we found our way to the Blue Domes for sunset. It had a bit of a crowd itself, but by the time blue hour hit, most people were gone and we had it to ourselves. When booking a trip to Santorini, we highly recommend renting a car. You can rent small cars for reasonable prices right on the island or book them with your flight. Santorini is larger than you think, and you'll appreciate having the freedom of a car. If you don't want to rent a car, Santorini has a surprisingly excellent transportation system. You can take the local bus from the airport to Fira. From there, you can take the bus to Oia, Imerovigli, Perissa, Kamari and Akrotiri. Get Your Guide offers airport transfers and transfer services on the island. As of now, there is no Uber or Lyft on Santorini. Taxis are plentiful on the island. Agree on the price before getting in. I know we said it is crowded, but there is a reason this is the place to watch the sunset on Santorini. It has the best sunset views on the island. Sitting in the ruins of the Santorini Castle to watch the sun go down over the windmills gives you incredible caldera views. Sneak a bottle of wine to sip in style as you relax in the festive atmosphere. 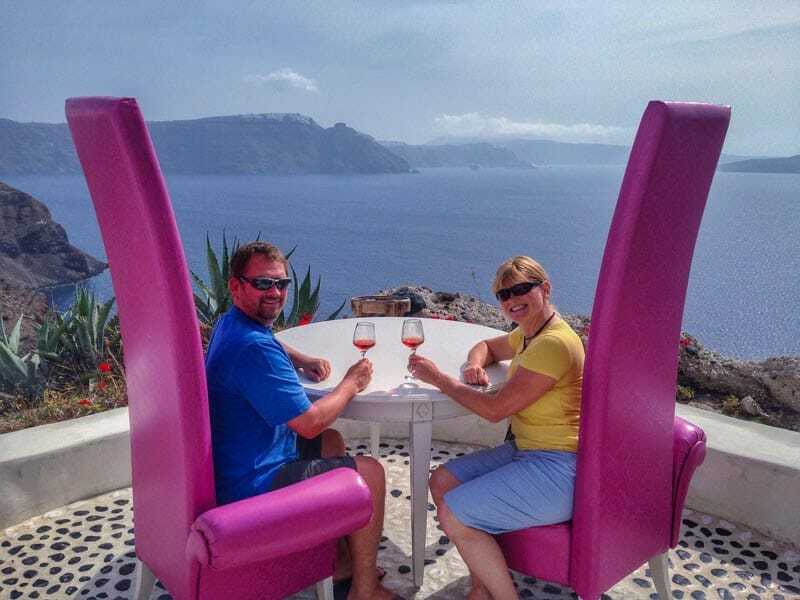 Or enjoy a sunset wine tour of Santorini where you can learn about Santorini wine followed by a glass while you to take in spectacular views. We actually walked from Imerovigli to Oia since we were staying at the time in Imerovigli but one of the amazing things to do in Santorini is to hike from Fira through Imerovigli and Firostefani to Oia. It's such a fun way to take in the different villages and all the different views from the caldera. 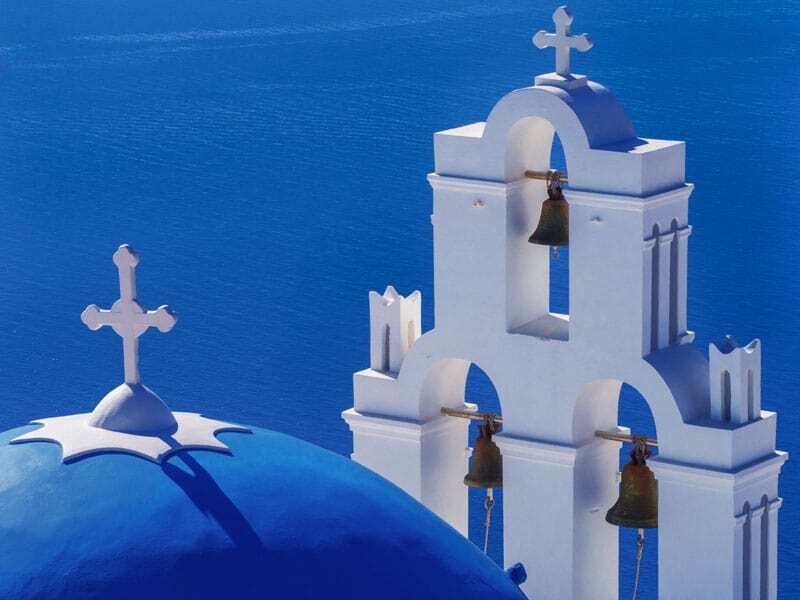 Next to the Blue Domes of Oia, the Three Bells of Fira are the most photographed site on Santorini. If you like museums this is a good stop to see the finds from excavations of Akritori. The most notable find? Fossilized olive tree leaves from within the caldera. Fira is by far the busiest of towns in Santorini with cruise ships coming in here at the port and passengers taking the gondola or doing donkey rides up from the water. 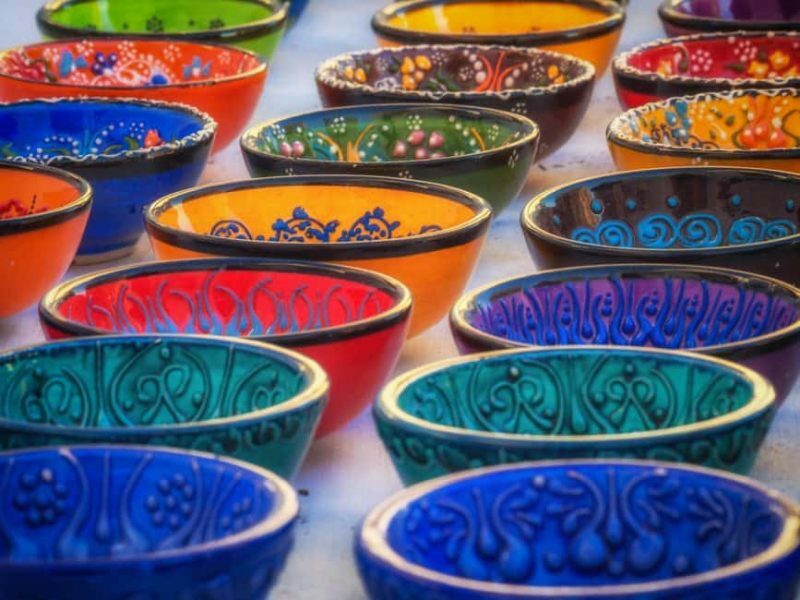 While there is lots of shopping in Oia as well, Fira is the place to find your souvenirs. The Church Holy Cross in Perissa was a highlight of our walk through the village. Perissa is 15 km south of Fira and if you want to enjoy beach life, this is a good spot to make a base. It has the alleyways and beauty of Oia without the crowds. Perissa is still very busy since it is close to Black Beach, but it another great place to explore. Santorini has a surprising number of wineries for one single island. 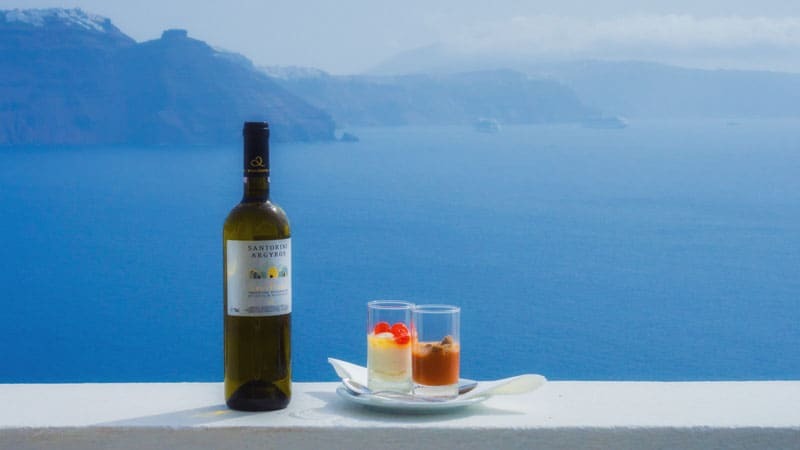 Wine tours are popular on Santorini and are an excellent way to explore more of the island while soaking in the culture. Learning to cook Greek food was one of the best things we ever did. 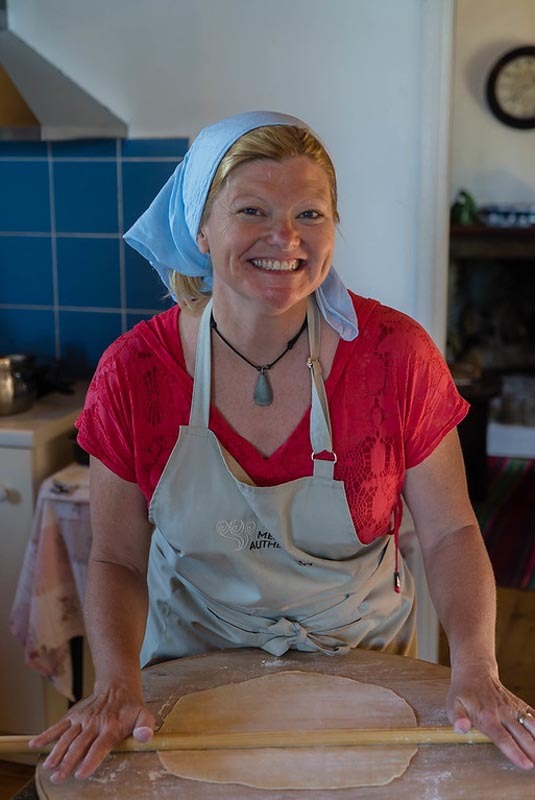 We take a lot of cooking classes whenever we travel and Greek food is the best! When you learn how to make iconic food in the destination, it makes for a special experience when you come home to relive your Santorini vacation. So take a cooking class in Santorini that includes wine tasting at two wineries and a chance to sample your hard work at the end! Ever since those Oikos commercials where the woman daydreams about eating yogurt in Santorini have I wanted to do the same. It was a dream come true to have Greek yogurt with fresh Santorini honey drizzled atop my bowl filled with fresh the fresh and delicious treat! This is definitely the quietest town we visited in Santorini. Located high on a hill it offers excellent views of the island. We got lost wandering its back streets. We barely saw another tourist while exploring Pygros and we even came across some blue domes of its own. In the town of Megalohori, we had our own villa with a private pool. This town feels like a spot where the locals live. Here we had the chance to shop for local cuisine and wine. 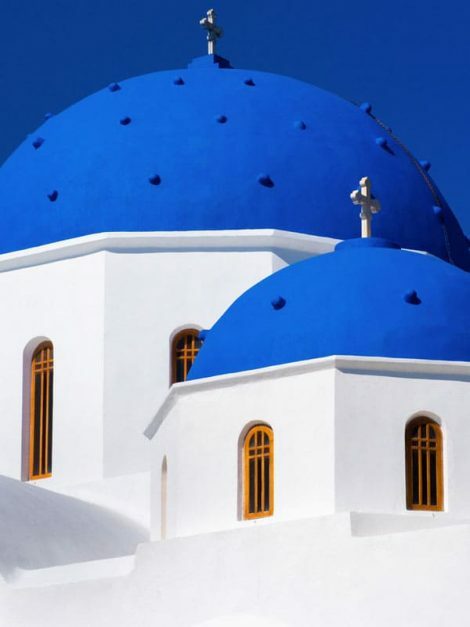 Greece is known for its ancient ruins and Santorini is no exception. The ruins of Akrotiri date back to the Bronz Age (3000 - 1200 BC). Because it was buried by ash of a volcanic eruption, the anqiquities and frescoes are quite well preserved. While this is a popular tourist attraction, visiting the town of Akrotiri is also a must. Not a lot of people spend time in the village so it has a nice small village feel. If you are looking for something unique to do in Santorini there is an open-air cinema in Kamari village. When traveling, we miss going to the movies, so it is nice to have a night out. Plus, you can enjoy a movie with a glass of wine and popcorn! Kamari is one of the most visited beaches in Santorini and there are plenty of places to stay nearby. There are many villages to see on Santorini and the best way to really explore the island is to rent a car. We got a steal in the offseason on a small budget car and set out each day to explore somewhere new. It's a way to find secluded beaches, quiet restaurants, and hidden markets. So what do you think? There Really is a lot of things to do in Santorini right? 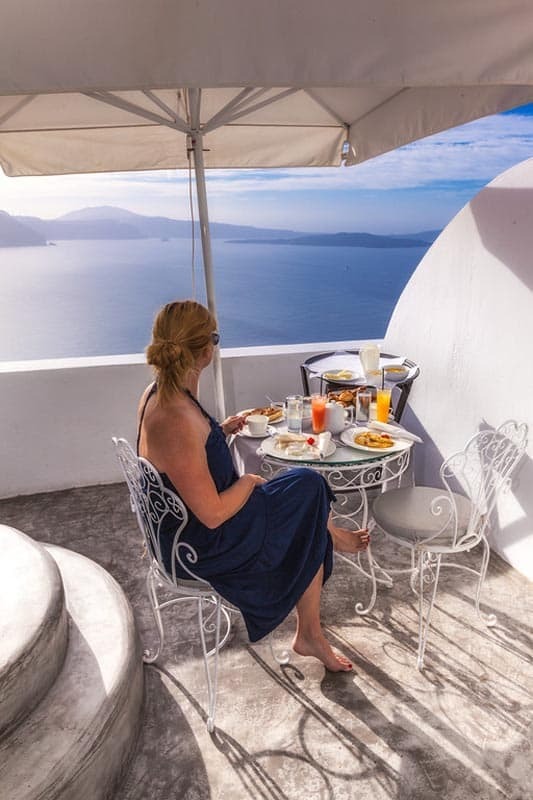 When we were planning our trip, we were overwhelmed with choices of where to stay in Santorini. There are several villages and different places on the island and we couldn't decide. Lucky for you, we stayed in three different areas and explored a lot of the island to help you decide where to stay. Oia - This was our favorite spot to stay in Santorini. 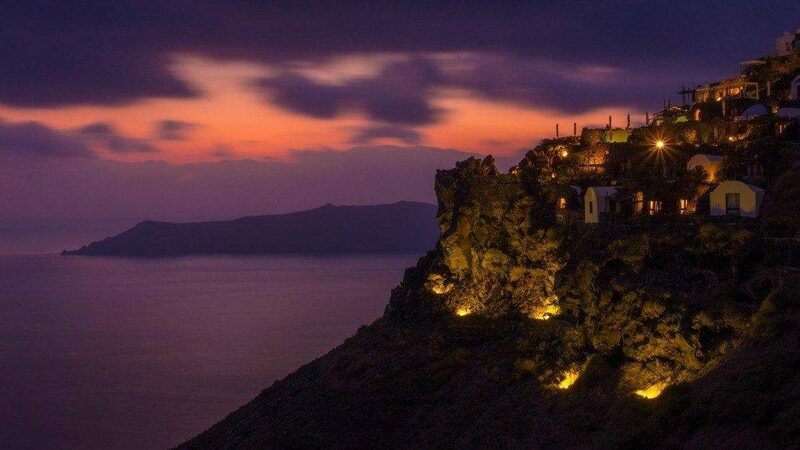 It is the most popular village on Santorini with the most iconic views. But it is busy and expensive. Fira - Fira is where the cruise ships dock making for a very busy village at high season. It's great for shopping and there are a lot of hotel choices. It is also very central. Imerovigli - This is a beautiful location that is much quieter than Oia and Fira. You can still stay in cave hotels and luxury hotels with infinity pools. It is along the walk between Fira and Oia. Perissa - If you want to spend time at the beaches, Perissa is located right at the Black Beach. We found it to be out of the way for anything else, but while we enjoyed the beach life, it was great. We actually stayed in Oia, Imerovigli and Perissa. We would have liked to stay in Fira and we did check out a beautiful hotel. 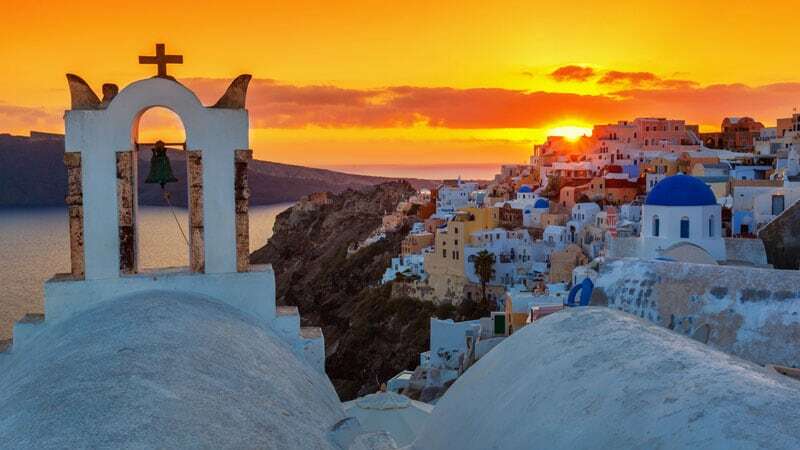 If you are visiting Santorini for just a few hours on a cruise, a fast way to get up to Fira Town quickly so you can appreciate more of the island. It was designed to bring 1200 people per hour up from the Fira port. A portion of the tickets go to the mule drivers to help them continue to thrive. We flew from Santorini from Athens. It was quick and easy and by purchasing our flight and hotel together we saved big. We left Santorini by ferry direct to Crete. Ferry's depart and arrive daily from the old port and we grabbed a ferry to Crete to continue exploring the Greek Islands. There are flights daily from Athens and Ferries daily from Athens year round. 44 Responses to "The Very Best Things to do in Santorini"
By seeing images and information this place looking very interesting and i would visit this place one day. Greece is such a wonderful place to go. Reading these blogs maks m feel that I am actually there. Hope I can make it soon. Really stunning views..I ve been there once and spent three nights..
OMG dream destination for sure! The colours and textures of this beautiful place is so inspiring! We totally fell in love with the island and cannot wait to visit again. There are way to many beaches that we would love to go back to. I managed to do one of the sailing tours and go to see a couple more that are definitely going on the list for the next visit. WOW, ALL THESE ARE JUST BREATHTAKING IMAGES, Amazing place and amazing photos! Thanks for sharing this useful list.I am looking for this list for a long time and found it on your blog. Oh it’s just wonderful. Historic and modern, for old souls and young ones. Just amazing. P.S. Please make a guide for Serbia, it’s the only one missing for the Balkan area, and I was really looking forward to that one. Beautiful pictures … I liked Greece. 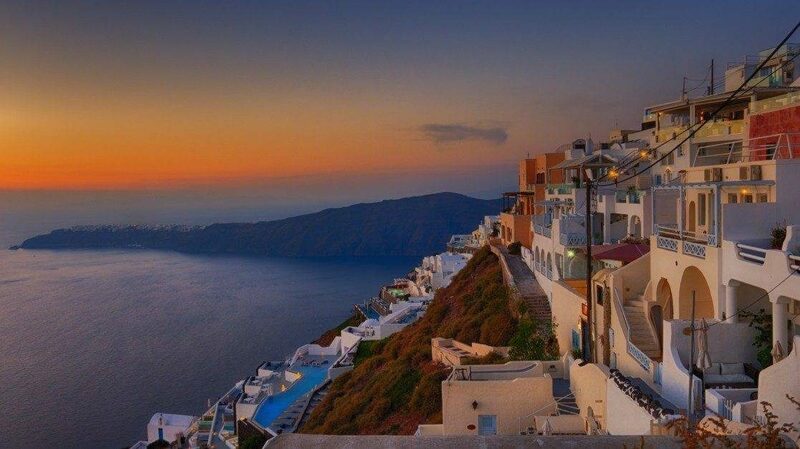 Santorini is at the top of my bucket list…. All images are really eye catching. It’s inspiring thanks for sharing. These pictures are absolutely stunning, this is one place definitely on my to do list. Santorini the most luxury island of GREECE ,whit amazing view and ugly beaches . Wow absolutely amazing pictures guys! 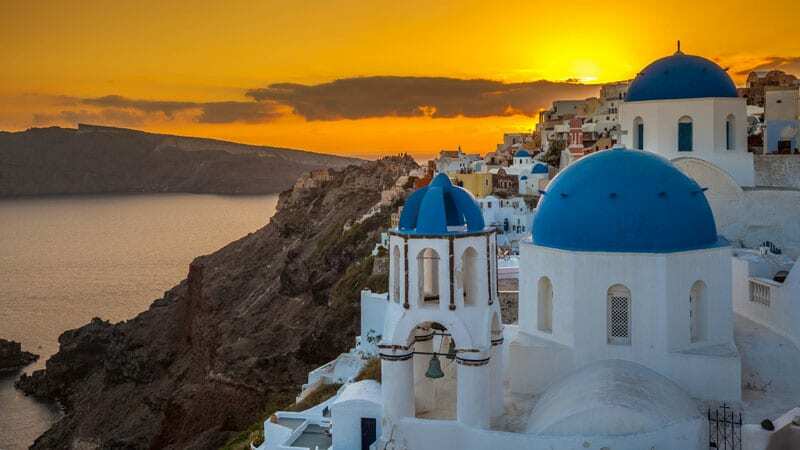 Santorini looks incredible and I really want to visit – thanks for sharing! Wonderful pictures 🙂 I am so going to Santorini this summer, haven’t booked it yet but I am going no matter what. It is on my bucket list for this years travel. Simply beautiful! I think I need to start moving Greece up the list. It was our first time visiting too! I can’t believe we hadn’t gone sooner. Can’t wait to go back! 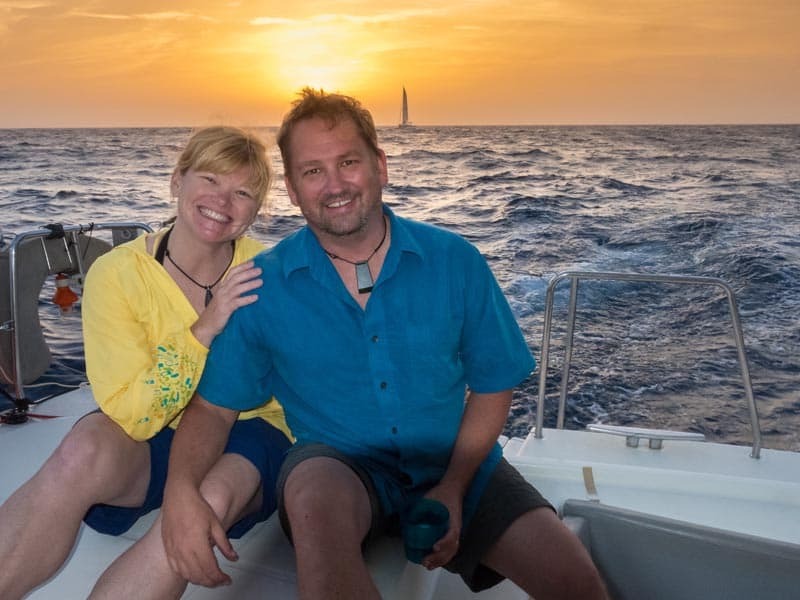 Dave and Deb, it’s always such a pleasure to read about your travel journeys. The pictures are so beautiful. Santorini seems like a perfect destination for couples. Reading about your Santorini experience from my cozy couch was an absolute delight!. Thank you Zoey! You are right, it’s perfect for couples, I can’t imagine visiting it solo. I have to say, I think if I were there alone, I’d be yearning to have a loved one with me, it’s just too romantic! Awesome..incredibly beautiful photos…and thanx for mentioning the off season.. I see pictures of Santorini every time I go on Pinterest. Looks like such a beautiful place. One day! Great photos as always. The Greek islands have always been at the top of my bucket list, and this makes me even more eager to go. Your photos are spectacular — Santorini looks almost too good to be true. I would have wondered about the weather in October, but from these shots, it looks more than fine. I can see you enjoyed yourselves! Awesome post and fantastic photos! We went to Mykonos a few years ago and fell in love with it there. Mykonos can get a bit crazy in peak season. We went in May luckily. Do you know if Santorini is similar like that? Wow, these pictures are absolutely gorgeous. We’re going to Italy this summer and a visit to Greece is an option too. Santorini has always been a place that I’d like to see. Beautiful views! I can tell I’d much prefer visiting in the low season.